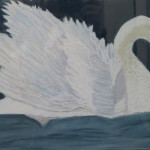 This gallery is for BVAA member Marie Cafferty. 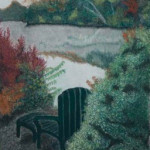 Painting with pastels became a joyous pursuit for me during my retirement years. I was long considered creative, but I considered myself a craft person in spite of family and friends encouraging me to further delve into art. 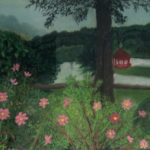 When I retired from teaching in 1999, I began taking art classes at the Worcester Art Museum. Oriental Brush painting with Ming-Chien Liang opened my eyes to a whole new world. Ming encouraged me to take drawing classes. When Alexander Farquhar son saw my work in charcoal, he said I had found my medium! I said “What about color?” He said try pastels! I started taking classes with Ella Delyanis, and have been indulging in pastel painting ever since. Pastels allow my thoughts about my subjects to flow directly through my fingers to the paper. I recall the moment I snapped the picture of a pet, a garden, or a scene and the emotions that caused me to take a photo in the first instance. Thanks to the many teachers at WAM I have learned to see with more of an artist eye, to eliminate the extraneous, experiment with the hundreds of color choices pastels offer, and so relive the enjoyment of the original moment. 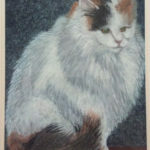 I joined the BVAA and am now inspired by my fellow artists to continue improving my technique in pastels and also to experiment with other mediums. I was pleasantly surprised to receive two honorable mentions in juried shows! The journey from wondering if I could really learn to express my love of nature in a painting has been a long one. I owe the current successful fulfillment of the journey to family, friends and the teachers of WAM. I hope you enjoy my efforts and are perhaps inspired to embark on an artistic journey of your own! Miss Cafferty,Richard Quinn here,I currently reside in Cape Coral Florida and I am glad to see you are doing well.I still remember you as a great teacher back in Burncoat Jr High .I was probably an obnoxous student but still respected you highly.Hope your life continues to go well and full of enjoyment in your twilight years.Richard D.Quinn/e-mail Heavyhauler369@aol.com.